It can be hard to find unique wedding gifts. The hunt for something adorable, meaningful, and budget-friendly can be exhausting. This adorable DIY wedding gift is the perfect solution. 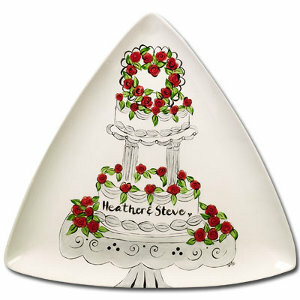 The Scrumptious Cake Keepsake Plate is entirely customizable. Any bride would squeal when she opened up this adorable gift. If you are not a gifted painter, there is no need to worry. A printable free wedding template is provided in the instructions, making it super easy to paint your own pottery creation for a very special bride and groom. 1.) Clean greenware and fire to shelf cone 04 bisque. 2.) Transfer pattern to ware with clay carbon and pencil. 3.) Load the SB 806 No 6 Round with CN 201 Light Grey and apply one (1) coat to stand working from bottom of stand to top edge. Also apply to scalloped trim on cake tiers and cake. 4.) With the SB 808 No 4 Round, load with CN 172 Bright Kelp and pull one side of brush through CN 173 Dark Kelp. Add leaves to design using a press, pull and lift stroke applying one (1) coat. 5.) Load the small Round with CN 072 Bright Scarlet and dab in roses. 6.) Detail entire piece with CN 253 Dark Black and the SB 802 No 1 Liner. Personalize cake with names of the couple. 7.) Let dry, then dip piece in CN 2000D Clear Dipping. 8.) When dry, stilt and fire to shelf cone 06.